Make a personal statement as you ride with motorcycle flags. They are designed to remain out of the way while maintaining a highly visible role on your bike. Some attach to the luggage rack for quick and painless installation. Others fasten to the antenna or sissy bar. 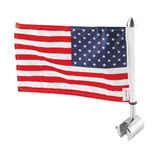 We choose to carry quality flags and flag poles developed from brands like Pro Pad and Show Chrome Accessories. They are designed with durability in mind and can withstand normal highway use. 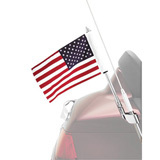 If you’ve already got a flag pole mounted to your motorcycle, we also carry replacement flags. They come in two sizes: highway (6"×9") or parade (10"×15"). Most poles come standard with the USA flag. 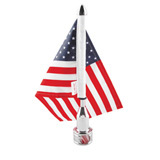 It’s the perfect way to proudly display your patriotism for everyone around. 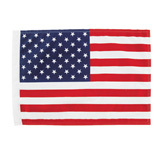 However, we also have a few other styles available among our replacement flags. 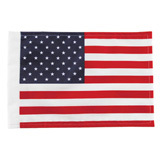 POW/MIA flags are ideal for remembering the nation’s soldiers who were either captured or never accounted for. If you wish to honor a friend or loved one who appears forgotten by others, it is the perfect accessory. If you’re a southerner, you might also be interested in a Dixie flag to show your pride. Pick up one of these excellent motorcycle flags today – they’re the ideal complement for any existing setup on your bike. Latest Flags & Mounts Reviews – You could win up to $500 for reviewing products! Had several of these on different machines! These are my favorite flag holders. I've had several on different machines over the years and they all have worked flawlessly. Bought this so I could take my kx250f on the dunes. Anyone who’s been to silver lake knows how much abuse the flags put on mounts no matter what’s its on. Basically the mount was paper thin aluminum. Might be good for a small light weight flag but I didn’t bother to even install it, would bend right away. Looks and works ok ?? Easy to install on flag pole ?? Installed on General 2018 was easy and looks awesome ?? Easy to install and looks great on my General Polaris ?? Looks great work great ?? Works great easy to install ? ?